The Jxta2 middleware is a set of open, generalized peer-to-peer protocols that allow any connected device (cell phone to PDA, PC to server) on the network to communicate and collaborate. Jxta is an open-source project that has been developed by a number of contributors and as such, it is still evolving. For the most recent Jxta Technology Specification, see . The goal of project Jxta is to develop and standardize basic building blocks and services to enable developers to build and deploy interoperable P2P services and applications. The Jxta project intends to address this problem by providing a simple and generic P2P platform to host any kind of network services. The term Jxta is short for juxtapose, as in side by side. 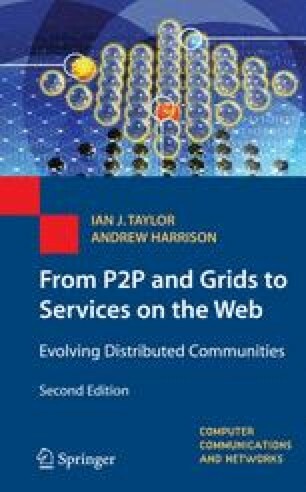 It is a recognition that P2P is juxtaposed to client/server or Web-based computing, which is today's traditional distributed-computing model. Jxta provides a common set of open protocols3 and an open-source reference implementation for developing P2P applications.